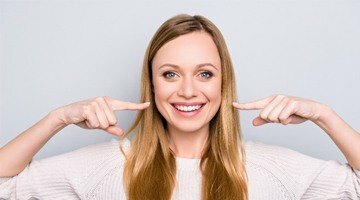 Why Choose White Clay Dental Associates for a Smile Makeover? When you look at your smile in pictures or in the mirror, do you notice flaws that you would like to fix? Perhaps you even try to hide your teeth because of them. In many situations in life, your smile can say a lot about you. What does yours say? Does it convey confidence? If you’re unhappy with how your smile looks, you don’t have to simply grin and bear it. At White Clay Dental, we have the expertise and skills needed to provide you with your very own smile makeover, giving you the beautiful teeth you’ve always wanted. Simply put, a smile makeover is the process of transforming the aesthetics of your teeth. It can consist of one simple procedure or several different procedures—whatever is necessary to get the desired results. Greater self-esteem. When you know your smile looks great, you feel more confident and want to share it more often. More happiness. Studies have shown that the act of smiling can give your mental health a boost. A smile makeover can give you a reason to show that smile more frequently. Younger appearance. As we age, our teeth can appear dull or worn down. A smile makeover can breathe new life into your smile, making you look years younger. Better oral health. Some cosmetic procedures, such as orthodontics, can make keeping your teeth clean easier. And a clean mouth is a healthy mouth. We will work with you to formulate the perfect combination of treatment methods just for you. For any cosmetic dental work, you need to be in good oral health. For example, if you have gum disease or a cavity, we’ll need to address that issue before we focus on any aesthetic changes. But if you have a healthy mouth, then you are likely eligible for a smile makeover. So if your smile needs a little TLC, you can turn to our experienced, compassionate team at White Clay Dental. We are dedicated to helping our patients achieve their smile goals and enjoy their teeth for years to come. But it all starts with a consultation with one of our talented dentists. To schedule your consultation, contact us today!